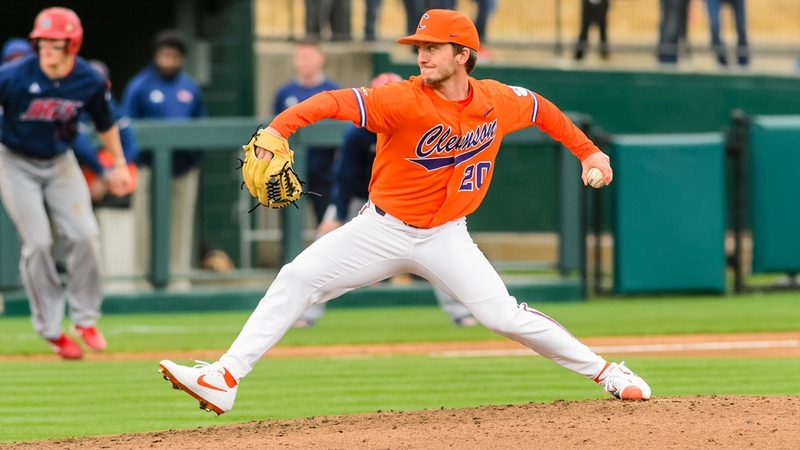 CLEMSON, S.C. - Sophomore lefthander Mat Clark allowed just one run on four hits in a career-long 7.1 innings pitched to lead No. 13 Clemson to a 6-3 victory over No. 8 Louisville at Doug Kingsmore Stadium on Saturday. The Tigers, who took a 2-0 lead in the series, improved to 24-7 overall and 11-3 in the ACC. The Cardinals fell to 23-8 overall and 9-5 in ACC play. Clark (7-0) earned the win by giving up just one walk with two strikeouts in facing just three batters over the minimum. He threw 77 pitches (47 strikes), including no more than 13 in an inning, and did not allow a Cardinal past first base until the eighth inning. Carson Spiers registered the last two outs of the game to record his ninth save of the year. Louisville starter Nick Bennett (4-2) suffered the loss, as he yielded seven hits, five runs and two walks with five strikeouts in 5.0 innings pitched. Sam Hall lined a run-scoring single in the third inning, then Grayson Byrd led off the fourth inning with his fourth homer of the season. Hall laced a run-scoring double in the fifth inning, then Byrd lined a two-out, two-run single in the frame. The Cardinals got on the scoreboard in the top of the eighth inning on Drew Campbell's run-scoring single. Bryar Hawkins crushed a solo homer, his third of the season, in the bottom of the eighth inning. The series concludes Sunday at noon on ACC Network Extra. Kids can run the bases after the game.